GTA Online: Executives and Other Criminals, the Next Level or a New Low? 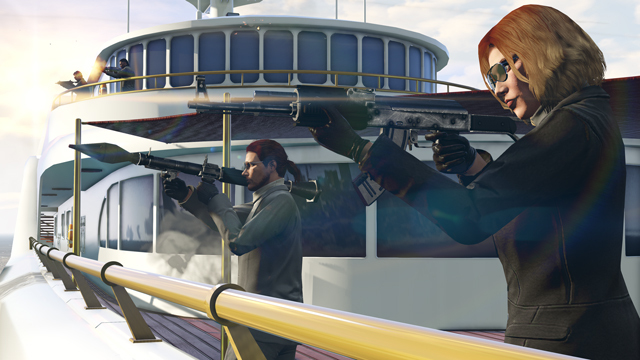 Rockstar Games has released the next step for GTA Online, Executives and other Criminals. But will it be a step in the right direction? It is mid-week last week, Rockstar Games have just announced the next DLC to release for their record-breaking online twist to their age old franchise and we're all left awestruck. Has Rockstar really taken this game to a whole new level? First impressions from the release trailer pointed in that direction, however, is the content that was showcased and what was actually released both pointing in the same direction? When I first started playing GTA: Online, having gotten through all the server issues that plagued the release, I joined a crew. We spent our time in free-roam sessions annoying other players, driving or messing about but really, there was no need to actually have a crew in free-roam. You had your friends list for that. Now, Rockstar has brought a new level of gameplay to GTA: Online, by giving us the ability to start and run our own "organizations." Players can become a VIPs and hire up to 4 other players as their bodyguards. This is a novel idea as not only do the players get RP and cash payments just for being in the area of their VIP, but when they complete special challenges and tasks the whole crew gets a cut. Playing as the VIP will grant you access to several special abilities such as the ability to turn your organisation into a "Ghost Organisation," allowing your whole team to go off the radar for two minutes or the ability to "Bribe Authorities," where a payment is made on your behalf to the local authorities to ensure that your crew walks free from its current wanted level and remains above the law for one and a half minutes. VIPs can also drop ammo, bull-shark testosterone, spawn certain vehicles and control the outfits of their whole crew on the go using the new SecuroServ app and corresponding interaction menu entry. Included with this update are several new game modes specific to free-roam called "VIP Work." These challenges can be played by smaller or full teams and are started by the organisations VIP. These challenges are similar to the other free-roam challenges already implemented and can really break up a boring session. The new modes and their descriptions are listed below. Hostile Takeover, an unknown package is held within a restricted area, and organizations compete to collect the package and deliver it to a set location. Sounds deceptively simple, but when the ‘package’ is a tank held inside Fort Zancudo, things get tricky fast. Asset Recovery sends your organization to LSPD stations around the city to recover impounded vehicles. It’s up to your outfit to free up those assets and return them to a designated location, while the cops and other players in the session will be looking to destroy your vehicles. 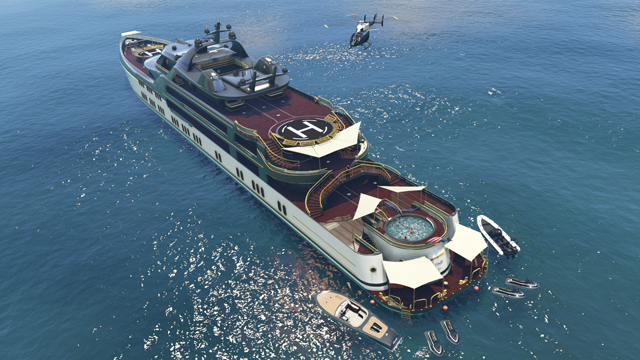 Also added in this update is the lavish super-yacht. 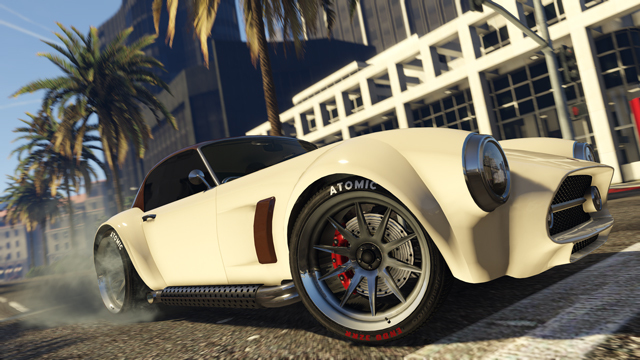 These hulks of extravagance are available to purchase from the Docktease website, and are the new status symbol in the underworld of Los Santos. The yacht comes in three varieties to suit most budgets and acts as a floating apartment. Yachts can be personalized in terms of colour scheme, exterior lighting, name and flag. Yachts come with their own fleet of vehicles such as the swift or Super Volito helicopters, Seashark jet-skis and Dinghys. Once you have purchased a yacht, the captain is added to your phone as a contact and you can call him to request your personal vehicle to meet you on the shore or to request a helicopter or boat to get you to your yacht or the shore. You can only own one yacht and it does not count as one of your 5 allowed properties. The Yacht itself cannot be sailed by the player however it can be moved to one of twelve locations for a cost of $25,000. Up to three Yachts can be moored at each of these locations at one time. The prices for each yacht is listed below, though if you want all the bells and whistles, you could pay up to another two million dollars on top of these prices. Owning a yacht will grant you access to the "Yacht Services" entry on the interaction menu. Here you can sound the horn, request a personal vehicle, helicopter or boat. There is a fee for using both the helicopter and boat options but it is relatively small compared to those seen elsewhere. With the release of Executives and other Criminals, we also gain access to five unique new cars and 4 variations of cars already seen in game. The Benefactor Schafter has been beefed up with a v12 engine and is now available in both standard and long wheelbase versions, the Baller has received a VIP upgrade to the LE version and this too is available in both long wheelbase and standard versions. Being a VIP, you'll want to be surrounded in armour plate too, available as an option on all the new 4 door cars, with this installed, you won't have to worry as you're being driven to the next important meeting. Listed below are all the new cars and their prices. Also available for purchase is the new Super Volito and Super Volito Carbon helicopter costing $2,113,000 & $3,333,000 respectively. Players can also find a new six-shooter pistol and flick knife, with both bodyguard and VIP variants in their local Ammu-Nation. Eclipse towers penthouse sweets are now for sale. These top floor apartments are the ultimate in lavish bachelor living. Including a heist planning room, why not make this the hub for your next bank job? You can pick from several different styles for your new apartment. This will change everything from the furniture style and wall coverings to your bed and bathroom. Mansions are not available. Available in their place are several new stilt houses on the hills. These homes are ultra modern on the inside with some boasting water fountains or ponds, but one issue that needs to be addressed is that you cannot enter your garage directly from inside the property. You would need to go outside and then enter your garage. Not so handy when you are the VIP and everyone wants your blood. Executives and other Criminals certainly has brought new life to the game. Yesterday it was rare that I would find myself in a session that wasn't full but as is becoming common with developers these days, I couldn't help but get the feeling that this is another update in a string of overpriced in-game items designed to spur sales of purchasable in-game credit. There certainly is a lot to do in sessions now, but these things are expensive. Ammunition is not cheap and neither is paying for the insurance for someone's vehicle if you happen to make it spontaneously fall to pieces. That being said, the developer seems set on making it slightly easier to make small sums of in-game cash. 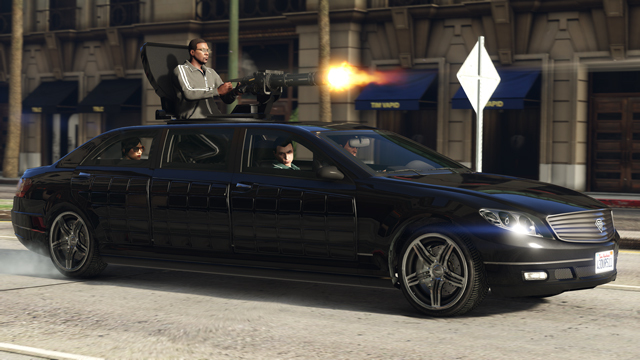 The new game modes combined with the payment you get for being either a VIP or bodyguard mean that after a good night in free-roam you could be up by more than $100k which to me is far more fun than grinding the same missions over and over. All in all, this update has been one of the best yet. It gives us reason to have and operate within a crew in free-roam and gives us yet more space to store vehicles with the ability to purchase a fifth property, potentially owning 50 vehicles but it is, as always, rather over priced. The options are as always friends, grind missions, heists or cheat but if you want it, you can have it in the criminal streets of Los Santos. nicholasbroo, LookBroZombies_XBL, DEATH GRIPS and 15 others like this. The Crew: Wild Run, Bringing the Game Closer to Perfection?